Legal documentation must be translated accurately to protect and promote your interests. Given the critical nature of most legal documentation, it is well advised that you work with a knowledgeable professional legal translation service. Note: For the definition of a”Certified Translator” from the American Translators Association, click here. Our professional legal translators have the education and expertise to translate international contracts, foreign laws, court documentation and government regulations. In many cases they only work in the legal field and some are attorneys themselves. The challenges of these translations include issues of equivalence, terminology, stylistic differences, and error and ambiguity in the source text. Conceptual equivalence between the source and the target text is often not straight forward between two different languages and/or legal systems. It is common that exact equivalence does not exist. The skill and knowledge of the translator makes the difference between a deficient and a good translation. For instance, many countries lack public jury “trial” processes and in many countries there is no equivalent concept. Legal translators must understand these differences and make critical decisions for the proper interpretation of the proceeding. Legal terminology also requires knowledge and experience to interpret it correctly both in the source and target languages. 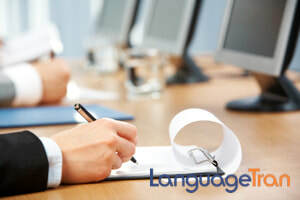 Legal translation services must avoid using “false friends” of “false cognates.” These are terms in the source language that closely resemble a similar sounding term in the target language. However, their meaning might be entirely different. Stylistic differences must also be reconciled when translating. In contractual documents, English legal tradition often stresses consistency through specific word repetition. The translator must handle repetitive terms in English that essentially have the same meaning in the target language. Finally, in addition to the legal theory, cultural and linguistic differences described above, the translator often faces all-too-frequent ambiguities and errors in the source text. The translator often walks a fine line between incorporating obvious insignificant errors into the translation and pointing out every possible ambiguity in the source text. In a few words, legal translations must reconcile the often competing goals of producing accurate and readable documents. The constant tension between these two goals requires experience, skill, perseverance, knowledge and integrity by the translation team. In the US a certified translation means that the legal translation service prints an affidavit and attaches it to a physical copy of the translated document attesting to the accuracy of the translation. The affidavit must be notarized to certify the document. COPYRIGHT © 2018 LangScript, Inc. All Rights Reserved.